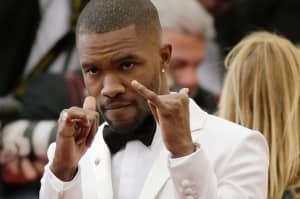 Frank Ocean's Beats 1 radio show, blonded RADIO, will air its second episode on Friday night at 10 pm. It's unclear at the moment if Ocean will premiere any new music. There is also no information at the moment about possible guests. On the last episode of blonded RADIO, Ocean curated a playlist of 28 tracks and interviewed Jay Z.
Update 12:00 a.m.: During Friday's show, Ocean dropped a new song, "Chanel," which you can listen to here. The track was played 18 times in the second hour of the show, including one version that featured a verse from A$AP Rocky. Ocean also created another playlist, this time with 19 songs. You can see the whole track list here. Listen to Beats 1 here.